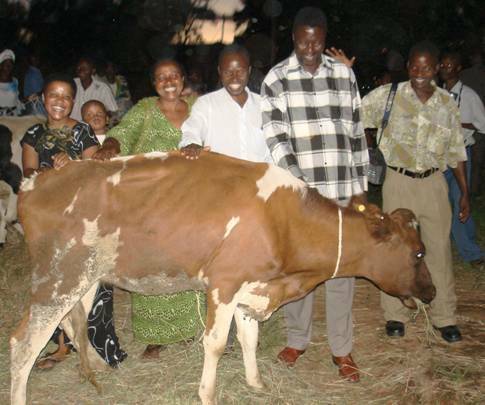 The Evangelical Lutheran Church in Tanzania has distributed 280 heifers to poor families between 2004 and 2009 through the Dairy Cattle Project in its effort to eradicate poverty in Tanzania. For those who have it may not be a big deal. But for the widow like one Modesta Malema who received a cow in April 2009 her life is changed now that she is able to get 16 litres of milk daily which is adequate to support her family of four. Some of her children have started going to school again having lost their father who was the sole bread earner. Modesta was among 30 beneficiaries in Nzega District who received heifers between April 24 and May 17, last year. Between February and March last year 30 cows were distributed to 30 farmers inChalinze District in Coast Region. At Mdaula Village in Chalinze Benedict Mkunare who received a heifer Dec 2004 was able to send his second born Topista Mkunare to Uganda to attend ordinary level secondary school. Topista will complete his ?A? Levels secondary school this year. 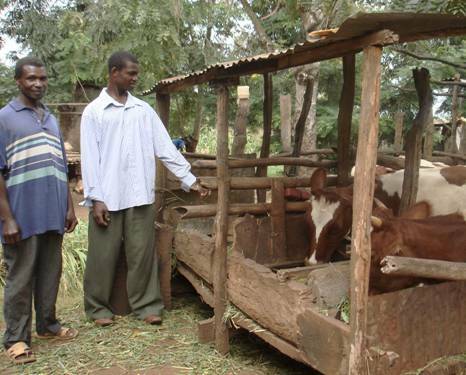 Benedict Mkunare and his son attending their cows. Patricia Mwaikenda the ELCT Coordinator of the Dairy Cattle Project (DCP) said many lives have been changed through the projects. Some farmers have been able to build houses, purchase land, send children to school and others have gained so much confidence that they have been vied and acquired leadership positions in their community. Depending on the needs and capacity, some families opt for dairy goats instead of cows, she explained. The Lutheran World Federation (LWF) provides the financial support for DCP to supply the animals as well as train farmers before and after receiving heifers or goats. The project has in place a mechanism to pick the poor families as beneficiaries of the project. Diocesan supervisors provide extension services to the farmers. Community Animal Health Workers are picked from among the farmers and trained in all villages under the project to assist farmers on health issues related to their cows. Annually DCP trains between 500 to 800 farmers who attend seminars to learn animal husbandry; dairy cattle management; gender and development; HIV and AIDS; entrepreneurship; environment conservation; organic farming and group formation and dynamics. Between 2004 and 2009 at least 5, 500 people have attended training seminars. As a result of group formation training, various enterprise groups have been formed especially in Southern Tanzania such as Savings and Credit Cooperative Societies (SACCOS), cooperative shops, bull fattening centres; crop cultivation in groups where they have vegetable gardens or organic crops for export. Other groups have acquired safes and started Village Cooperative Banks (VICOBA). Some of the VICOBAs have been so successful that they start with nothing and within a short period of less than six months they have at least TSh. 5 million in their bank account. They lend the money to members at a low interest rate compared to commercial banks. Therefore the savings from dairy business, which mostly entails selling milk, has enabled farmers not only engage in cooperative activities but also small scale entrepreneurship and increasingly chasing poverty away from their door steps.